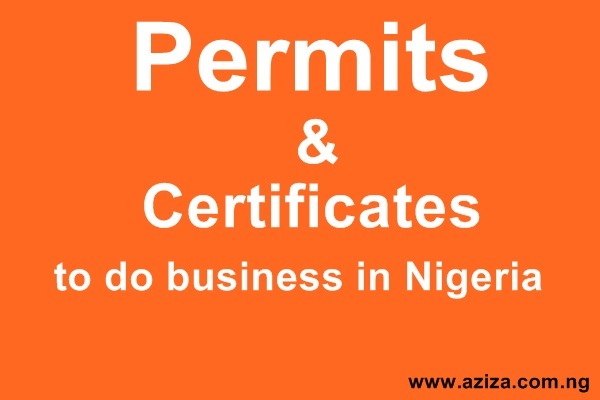 In this blog, we will explain how Business License And Permits works In Nigeria. Also, how to obtain business permit(s) and Expatriate Quota Certificate to work in Nigeria as a foreign citizen. I also clarify issues that confuse people in getting the right business permit(s) with right category where such exist. So, let’s go. To operate businesses legally in Nigeria, every Nigerian and foreigner must be licensed to carry on businesses, including obtaining the Nigerian Business Licenses and Permits. Note: Business License comes before Business Permit(s). There are business activities differs in several business sectors, so is some Permits and Licenses differs. The first step to take is to register your business as a legal entity. Issuance of a business licenses and permits in Nigeria is a means to regulate business activities of private and public organizations and also to generate revenue for governments. Business licenses are approvals given by the government or its agencies to individuals and corporate organisation to transact business in a particular location and/or sector; it is also an authority issued by the local government to operate a business in a particular location and/or sector. For example, if you want to operate your business in Nigerian Oil and Gas sector, after your business registration with CAC, the licenses and permits you will need will be mostly issued by Department of Petroleum Resources (DPR) permits. There is no unified licensing system; it varies from the tiers of government; the nature, location, type and size of the business determine its permit(s) and the type of license to be issued for its legal operations. The license issued to a fuel station no doubt is quite different from the one issued to a liquor dealer and so on. Opening business in Nigeria basically requires license or permit that will make the business officially and legally recognized. Citizens, who want to start a business, expand an existing business or to renovate the buildings etc. needs permits. Business licenses and permits help the governments (federal, state or local) in Nigeria to keep track of the citizen’s tax obligations as well as providing contact information for the owners. It is a business permit that allows business transactions to be done and also to be inspected and verified by inspectors from the city where the business is located. There are fees payable to obtain licenses or permits in Nigeria. Irrespective of the nature and location of your business, you need the business licenses or permits to operate. As there several licenses or permits a business may need to operate its business legitimately in Nigeria as some licenses or permits differs in different states and local government. This has made it necessary for businesses to consult Business Support experts like Aziza Nigeria to make sure your business operation is in the right track. The following are steps to secure a business licenses and permits in Nigeria. Determine the licenses/ permits and the class of such licenses/ permits your business need to operate. For example, for you to operate in Nigerian Oil and Gas as a service provider, you need DPR permit. In Department of Petroleum Resources (DPR) permits, you will need OGISP permit and OGISP has 3 categories and several permits that must suit the service(s) your business is providing. If you obtain a wrong category or OGISP permit, government will not allow you to operate with such permit(s). 2. Locate the government authority’s office or it’s website for those who have website. Time of completion and Collection center for the licenses or permits. Here, the business owner seeking a license is expected to supply his contact information, business name, the local government of origin, details about the type of business he is opening and so on. Once the license is issued, the business is now a legally entity that can operate in Nigeria. In some situation, the business owner may be required to display the license to the view of the public by placing it on the organisation board notice or wall. This assures customers that your business is legally recognized by the government. This differs from state/ local governments, location of operation and business activities your business would want to undertake in Nigeria. For example, in Nigerian Oil and Gas, any business activity(ies) that will be carried out at offshore will require a special permit call Offshore Safety Permit (OSP). Any Oil and Gas Business activities that will be done on Nigeria offshore territory will need Offshore Safety Permit (OSP) and other DPR permit(s) to operate. This is mandatory. Also, in some cities in Nigeria like Port Harcourt, Lagos and Abuja, permits are issued from different bodies own by Federal, state or local governments. There are some projects that don’t necessarily require permits, the codes department will update you if your proposed business requires a permit or not. In some cases, wrong tout may exploit the business who does not know and this is one of the reasons why you new Business Support Service Firm like Aziza Nigeria. Note that an application for information from relevant authorities on the business you are about going into attracts nominal fees. And if the business owner does not know or want to visit the authorized body/ department for the license(s) and/or permit(s), it is legal for him or her to consult a Business Support Service Firm to process the license(s) and/or permit(s). Obtaining a business license or a business permit is the first step a wise business man should take. This no doubt will make the business to be legally recognized and also will save you the embarrassment and possible litigation by the government or its agencies. Nigerian expatriate quota policy states the requirements for hiring expats in Nigeria. In order to work as an expatriate in Nigeria, your company or employer must meet certain criteria. For a foreigner to gain employment or work in Nigeria, you need Expatriate Quota Approval Certificate. The Immigration Act provides that no person other than a citizen of Nigeria shall accept employment (not being employment with the Federal or State government) without the consent in writing of the Director of Immigration; or either alone or in partnership with any other person, practice a profession or establish or take over any trade or business or register or take over a limited liability company without the consent in writing of the Minister. Procedure for applying for a Expatriate Quota Approval Certificate in Nigeria. writer an application letter to the Minister of Labour in Nigeria through the Director general of Migration. Attach the necessary documents together with the application letter and wait for few working days to process your papers. For Business permit in Nigeria, the Authorized share capital must not be less than N10 million in respect of each Company. Attach a Board member resolution this should indicate names of Directors present at the meeting and must be fully signed by the Chairman and Company Secretary. The secretary or your Business Support Agent then pays the required fees. The immigration officer then schedules for inspection of the company. For Your Business Support, Registration and Representation Services in Nigeria, contact us today quote. Feel free to share this post share on Facebook, Twitter and Google Plus.